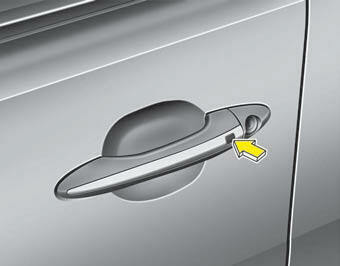 Pressing the button of the front outside door handles with all doors closed and any door unlocked, locks all the doors. The hazard warning lights will blink and the chime will sound once to indicate that all doors are locked. The button will only operate when the smart key is within 0.7~1 m (28~40 in.) from the outside door handle. If you want to make sure that a door has locked or not, you should check the door lock button inside the vehicle or pull the outside door handle. The ignition switch is in the ACC or ON position. Any door except the trunk is opened. Pressing the button of the driver's outside door handle with all doors closed and locked, unlocks the driver's door.The hazard warning lights will blink and the chime will sound twice to indicate that the driver's door is unlocked. Pressing the button in the front passenger's outside door handle with all doors closed and locked, unlocks all the doors. The hazard warning lights will blink and the chime will sound twice to indicate that all doors are unlocked. The button will only operate when the smart key is within 0.7~1 m (28~40 in.) from the outside door handle. You can start the engine without inserting the key. For detailed information refer to “Starting the engine with a smart key” in section 5.